Most meatloaves I know of are baked in a tin or hand molded into a loaf shape. 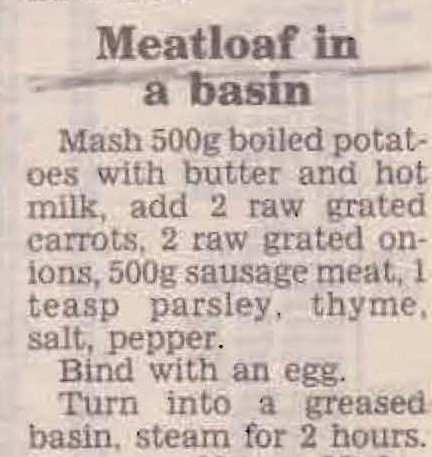 This is the first time I’ve seen a recipe that steams the loaf in a basin, but trust Mum to have cut out and kept something different. The combination of potato, carrot and onions together with sausage meat and some spices in this recipe should make for a tasty loaf. This entry was posted in All Recipes, Beef, Main Dishes, Uncategorized and tagged 1970s, carrot, meatloaf in a basin, onion, potatoes, sausage meat by bebsrecipes. Bookmark the permalink.